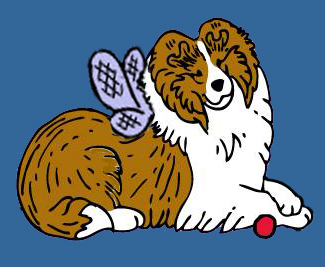 Sheltie Nation | Did you know? 10 things toxic to dogs. Did you know? 10 things toxic to dogs. Posted by Kelly on Nov 02, 2007. Many people give this fruit to their dogs as a treat. However, just a few bites can cause fatal kidney failure in some dogs. Both grapes and raisins can be toxic. Some dogs eat them with seemingly no ill effects. However, some dogs become ill after ingesting only a few grapes or raisins. The first symptom is vomiting, followed by acute kidney failure, from which many dogs do not recover. As of yet, the toxin is unknown, nor do we know why some dogs become sick and others eat grapes or raisins without a problem. The yeast-containing bread dough can ferment in the dog’s stomach, releasing large quantities of alcohol. Dogs may become very ill from alcohol poisoning. Small dogs are most susceptible to this toxicity. The ingestion of as few as six macadamia nuts has caused paralysis in dogs. Dogs with macadamia poisoning will appear anxious and have difficulty moving their rear legs. The legs may appear to be painful. Luckily, the paralysis is temporary and clears up within a few days. The causative agent of the paralysis is unknown. Salmon and trout can be infected with a parasite called Nanophyetus salmincola, a type of trematode worm. The worms themselves can be infected with a type of bacteria known as Neorickettsia helminthoeca. The bacteria only infects canids; other animals show no symptoms from eating it. When dogs eat raw fish infected with this bacteria, they can show symptoms including weakness, vomiting, loss of appetite, swollen glands, and fever. Ninety percent of untreated dogs die. However, cooking kills the worm and the bacteria. Onions and garlic contain a chemical called thiosulfate. When ingested either in large quantities or in small quantities over a long period of time, they can cause anemia. This is reversible if you stop feeding the onions or garlic. This toxicity usually occurs when dogs eat large amounts of sugar-free candy or gum. In humans, xylitol does not cause a drop in blood sugar; in dogs it does. This can lead to weakness, staggering, and other symptoms of hypoglycemia. There is also some evidence that some dogs may develop liver failure after ingesting xylitol. Read more about this here. Cooked bones are much more dangerous than raw bones. They are much more brittle than raw bones and can splinter into sharp shards. But why risk feeding any chicken bones? Give them something else. Dogs that are fed a straight diet of dry food with little variety- may get an inflammation of the pancreas called “pancreatitis” if they eat certain foods that they are not used to. In dogs, pancreatitis often results from eating a very high-fat meal. While dogs that are used to eating a high-fat diet, like sled dogs, can eat pure fat with no problems, dogs that are not used to such foods often cannot. When such a dog eats a high-fat meal, its pancreas overproduces enzymes, to the extent that they actually begin to “digest” the pancreas and inflame it. Common culprits are turkey skin and ham fat. Symptoms include vomiting and stomach pain. This is a medical emergency, and such dogs must be treated by a vet. Some breeds, like miniature schnauzers, are genetically predisposed to pancreatitis. A common food byproduct used in gardens has been found to cause vomiting, tremors and fast heartbeat when dogs eat it. Cocoa bean shells contain the same toxic theobromine that chocolate does, and are poisonous to dogs for the same reason. The mulch has an attractive chocolate smell that is irresistible to many dogs. See our previous post on Chocolate for more information on this toxic food. Despite common misconceptions, poinsettias are only mildly toxic, and most dogs who eat them will experience no symptoms at all. Some dogs will drool or vomit after eating them. Holly causes intense nausea, vomiting and diarrhea. Mistletoe causes vomiting, diarrhea, neurological problems and heart failure. Thanks to Linda for the great shot of Maxx getting his dinner! Next: Did you know? Tea Tree Oil is toxic to dogs. I have seen natural, organic or just regular pet foods that list garlic as an ingredient. Should I stop buying those for my Sheltie?